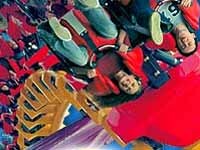 Situated on the outskirts of Benidorm, Terra Mitica is Spain's largest theme park and, with its rides, shows, restaurants and shops, can be a great day - or week - out for the whole family. Rides like the Tizona, an inverted roller coaster that reaches speeds of 62mph (100kmh) and heights of more than 100ft (31m) with visitors suspended beneath the track, and attractions like Warrior of the Dawn (a simulated game) provide exhilarating entertainment for all ages. The park is divided into five themed zones: Egypt, Greece, Rome, Iberia and the Mediterranean Islands. Recently the park has been further divided into two separate zones: Iberia Park is a free to enter area which operates on a token system; and Terra Mitica is a pay to enter area where all rides are free once inside. Although the park's size prevents queues from getting too long, there is not much shade and visitors should go prepared for the sun, especially in summer. The queuing sections are almost all cooled down by sprinkler systems which is a relief, and there are some great water rides to cool down on. In the peak summer months the park is often open till midnight and visiting at night is a wonderful option. Those who have difficulty walking can hire scooters to get around. Opening times: Opening days and times are different every month - check the calendar on the website for details. Admission: There are many different ticket options but a day pass is about €26.